In Catalonia, an autonomous community located in north-eastern Spain, the climate is Alpine (cold mountain climate) in the Pyrenees, on the border with France, it's oceanic (cool and wet) in the small area of the Garonne valley, located to the north of the Pyrenees, and it's Mediterranean along the coast, while in inland areas (see Lleida) it gets a little more continental and drier than the real Mediterranean climate. The rains exceed 1,000 millimeters (40 inches) per year in the Pyrenean area, where some rains and thunderstorms occur also in summer, they remain above 700 mm (27.5 in) in the Girona province, they hover around 600 mm (23.5 in) on the coast of Barcelona, and around 500 mm (20 in) on the coast of Tarragona, while they drop below 400 mm (16 in) in the central and southern inland areas (see Lleida), which are definitely arid. The amount of sunshine in Catalonia is very good in summer on the coast and in inland south-central areas: in Girona the average ranges from 4 hours of sunshine per day in December to 9 in July, in Barcelona and Tarragona from 4.5 hours in December to 10 in July, in Tortosa from 5 hours in December to 10.5 in July. In Lleida, lying in the interior, in winter there are more often fogs and low clouds, so much so that there are only 3 hours of sunshine per day in December, while summer is sunny as well, with as many as 11.5 sunshine hours in July. Here are the average daily sunshine hours in Barcelona. On the coast, the climate is Mediterranean, with mild, relatively rainy winters and hot, sunny summers, during which the air is humid, but tempered by the breeze. 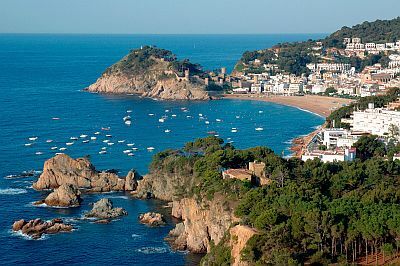 The northernmost part of the coast, in the province of Girona, is called Costa Brava. 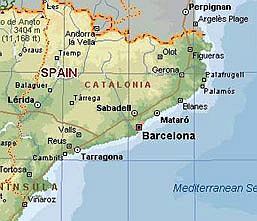 There are towns such as Portbou, Colera, Llançà, Cadaqués, Roses, Sant Pere Pescador, L'Escala, Estartit, Begur, Palafrugell, Palamós, Platja d'Aro, Sant Feliu de Guixols, Tossa de Mar, Lloret de Mar and Blanes. Owing to its northern location, the climate is quite cold in winter, the rains have two maxima in spring and autumn, and some occasional disturbances may pass over the area even in summer. Here are the average temperatures of Girona, the chief town, located at 25 km (15 miles) from the coast. In Girona, 720 mm (28.5 in) of rain fall per year, with a minimum in July and a maximum in October. The temperature of the sea is lower in the northernmost part of the Costa Brava than in the central and southern part, in fact, beyond the French border the Gulf of Lions receives cold Atlantic air masses for many months a year, which are able to cool down the sea. In Colera, the water temperature does not go over 21 °C (70 °F) in July and 22 °C (72 °F) in August. Further south, in the Gulf of Roses, the sea is never very warm, however, it reaches 23 °C (73 °F) in August, while in July the water temperature is still cool, around 21 °C (70 °F). Here is the temperature of the sea near Figueres. Continuing to the south, the sea temperature increases slightly, but remains cool enough, down to Palamós and Sant Feliu de Guíxols. In the southernmost part of the Costa Brava (see Tossa de Mar, Lloret de Mar, Blanes), the sea is warmer. Here is the temperature of the sea near Blanes. In the rest of the coast of Catalonia, in the provinces of Barcelona and Tarragona, the sea temperature is similar to that of Blanes, or it is, albeit slightly, even higher. South of Costa Brava, in the province of Barcelona we find the Costa de Barcelona, which includes towns like Sitges, Vilanova i la Geltru, Arenys de Mar, Malgrat de Mar, Santa Susanna, Calella, Castelldefels, Badalona, Mataro, Sant Pol de Mar and Canet de Mar. Here are the average temperatures of Barcelona. In Barcelona, precipitation amounts to 620 mm (24.5 in) per year, with an evident maximum in autumn due to the prevailing southern currents. In winter, the rains are not abundant: only 40 mm (1.6 in) per month from December to February. In Barcelona, the sea is warm enough for swimming from July to September, with a peak in August, of 25 °C (77 °F). In June, the sea is still cool, around 20 °C (68 °F). 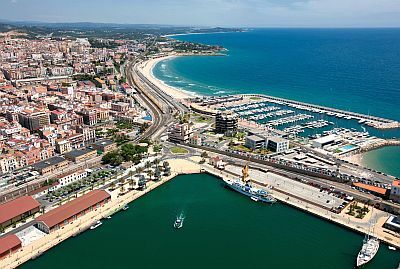 Further south, in the province of Tarragona, we find the Costa Dorada, which includes towns such as L'Espluga de Francoli, Salou, Tarragona, Valls, Mont-Roig del Camp, Montblanc, Prades, Altafulla and Calafell. Here the climate is Mediterranean, similar to that of the coast of Barcelona, though a bit drier. Here are the average temperatures of the airport of Reus, near Tarragona. In Reus, 500 mm (20 in) of rain fall per year; even here you can notice the autumn peak, while in winter it rains little. In the Costa Dorada, the sea is warm enough for swimming from July to September as well, with a maximum in August of 25 °C (77 °F), while in June it is still cool, around 20 °C (68 °F). Here, for example, are the sea temperatures near Tarragona. In the interior of Catalonia, in the Catalan Central Depression, which is actually a plain area, formed by the Ebro River and its tributaries, the climate is slightly more continental and more arid. In Lleida, the capital of the only landlocked province, the monthly average temperature ranges from 5 °C (41 °F) in January to 25 °C (77 °F) in July and August. In winter, nights are often cold, with possible slight frosts. In summer, scorching days are frequent, with peaks around 40 °C (104 °F), but the air is dry, and at night the temperature drops a lot. In Lleida, just 340 mm (13.5 in) of rain fall per year. You can notice the considerably low amount of rainfall in winter. There are also some mountain ranges parallel to the coast (the Catalan Mediterranean System), where the climate gets colder with increasing altitude. In the Montseny Massif, the highest point is Turó de l'Home, 1,707 meters (5,600 feet) high. 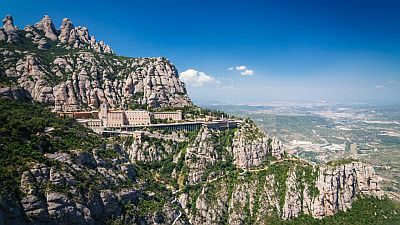 The range of Montserrat goes up to 1,236 meters (4,055 feet), but the monastery is at 700 meters (2,300 feet). In the valleys between these mountain ranges, in winter fog can form, while during cold spells from Eastern Europe it can snow at an altitude above 300 meters (1,000 feet). In the far north, along the border with France, we find the chain of the Pyrenees; the highest peak of Catalonia is Pica d'Estats, 3,143 meters (10,312 feet) high, on the border with France. In the area at the foot of the Pyrenees, at the same altitude, the climate is cooler than in the south-central region; in addition, this area is exposed to outbreaks of cold air, with strong winds, in winter. At high altitudes, in winter heavy snowfalls occur. Summer is cool, with possible afternoon thunderstorms, but given the position, some Atlantic fronts can affect this area even in this season. In the Pyrenean valleys, in winter cold spells can occur, with night frosts, while in periods of stable weather, cold and foggy days can occur; in summer, the temperatures are pleasantly warm during the day, but sometimes days with scorching heat are possible, even though the air is dry and nights remain cool. The best time to visit the Pyrenees and the valleys at the foot of the mountains is summer, since it is the warmest (or mildest) and sunniest of the year. The summer, from mid-June to August, is also the best time for a beach holiday in Catalonia. In low-lying inland areas (see Lleida), being the summer hot, you may prefer spring and autumn, especially in May, and from mid-September to mid-October, although the rains are more frequent. Those who can stand the heat can choose July and August even for this area, but should be ready to stroll around cities in hot weather.